This article is about Cutthroat trout. For other uses, see Cut-throat. The scientific name of the cutthroat trout is Oncorhynchus clarkii. Cutthroat trout were the first New World trout encountered by Europeans when in 1541, Spanish explorer Francisco de Coronado recorded seeing trout in the Pecos River near Santa Fe, New Mexico. These were most likely Rio Grande cutthroat trout (O. c. virginalis) The species was first described in the journals of explorer William Clark from specimens obtained during the Lewis and Clark Expedition from the Missouri River near Great Falls, Montana, and these were most likely the westslope cutthroat trout (O. c. lewisi). As one of Lewis and Clark's many missions was to describe the flora and fauna encountered during their expedition, cutthroat trout were given the name Salmo clarkii in honor of William Clark. In 1836, the type specimen of S. clarkii was described by naturalist John Richardson from a tributary of the lower Columbia River, identified as the "Katpootl", which was perhaps the Lewis River as there was a Multnomah village of similar name at the confluence. This type specimen was most likely the coastal cutthroat trout subspecies O. c. clarkii. Until the 1960s, populations of westslope cutthroat trout and Yellowstone cutthroat trout were lumped into one subspecies; Salmo clarkii lewisii. Biologists later split the group into two subspecies, christening the name westslope cutthroat trout with the lewisii name which honors explorer Meriwether Lewis and renaming the Yellowstone cutthroat trout Salmo bouvierii, the first name given to the Yellowstone cutthroat trout by David Starr Jordan in 1883 honoring a U.S. Army Captain Bouvier. In 1989, morphological and genetic studies indicated trout of the Pacific basin were genetically closer to Pacific salmon (Oncorhynchus species) than to the Salmos–brown trout (S. trutta) or Atlantic salmon (S. salar) of the Atlantic basin. Thus, in 1989, taxonomic authorities moved the rainbow, cutthroat and other Pacific basin trout into the genus Oncorhynchus. Behnke in his salmon and trout handbook of 2002 recognized 14 subspecies of cutthroat trout that are each native to a separate geographic area. Not all of them were scientifically described, and different views on the taxonomic identities have been presented in some cases. It has been suggested that the cutthroat trout evolved from a common Oncorhynchus ancestor that migrated along the Pacific coast and into the mountain west primarily via the Columbia and Snake river basins 3-5 million years ago, in the late Pliocene or early Pleistocene epochs. These epochs had repeated glacial and interglacial periods that would have caused repeated fracturing and isolation of cutthroat trout populations, eventually resulting in the different subspecies found today. The 14 subspecies are found in four evolutionary groups—Coastal, Westslope, Yellowstone and Lahontan. Pacific Coast Coastal cutthroat trout, also known as "sea-run" cutthroat trout. O. c. clarkii (Richardson, 1836) Native in coastal tributaries from northern California to Alaska. O. c. clarkii is the type subspecies for cutthroat trout. Lake Crescent cutthroat trout O. c. crescenti No longer a recognized subspecies, but is a unique population of coastal cutthroat trout endemic to Lake Crescent, Washington. Great Basin Alvord cutthroat trout O. c. alvordensis† Behnke, 2002 Was endemic to tributaries of Alvord Lake in southeastern Oregon; it is considered extinct. Bonneville cutthroat trout O. c. utah (G. Suckley, 1874) Native to tributaries of the Great Salt Lake and other tributaries in the Bonneville basin. Humboldt cutthroat trout O. c. humboldtensis Trotter and Behnke, 2008 Upper Humboldt River, upper Quinn River, and Whitehorse (Coyote) basin, Nevada and Oregon. Considered by the Nevada Division of Wildlife to be a population of O. c. henshawi. Lahontan cutthroat trout O. c. henshawi (Gill and Jordan, 1878) Native in eastern California and western Nevada. Is designated as threatened (1975). Whitehorse Basin cutthroat trout Considered a separate subspecies by Behnke (2002), but not by Trotter & Behnke (2008). Native to southeastern Oregon. Considered a distinct population segment of Lahontan cutthroat trout by the U.S. Fish and Wildlife Service, and of Humboldt cutthroat trout by Trotter and Behnke (2008). Paiute cutthroat trout O. c. seleniris (J. O. Snyder, 1933) Endemic to eastern Sierra Nevada Mountains, and is designated as threatened (1975). Northern Rockies Snake River fine-spotted cutthroat trout O. c. behnkei (Montgomery, 1995) Considered by some as a population of O. c. bouvieri. It is native to the Snake River of Idaho and Wyoming. Westslope cutthroat trout O. c. lewisi (Suckley, 1856) Native to northern Idaho, Montana, British Columbia, and Alberta. Yellowfin cutthroat trout O. c. macdonaldi† (Jordan & Fisher, 1891) Was endemic to Twin Lakes, Colorado; it is now extinct. Yellowstone cutthroat trout O. c. bouvierii (Jordan and Gilbert, 1883) Native to the upper Snake River, Yellowstone Lake, and Yellowstone River, in Idaho, Montana and Wyoming. Southern Rockies Colorado River cutthroat trout O. c. pleuriticus (Cope, 1872) Native to tributaries of the Green and Colorado Rivers. Greenback cutthroat trout O. c. stomias (Cope, 1871) Native to the Arkansas and South Platte River headwaters on the eastern slopes of the Rocky Mountains in Colorado; it is designated as threatened (1978). Rio Grande cutthroat trout O. c. virginalis (Girard, 1856) Native to New Mexico and southern Colorado. Throughout their native and introduced ranges, cutthroat trout vary widely in size, coloration and habitat selection. Their coloration can range from golden to gray to green on the back. Cutthroat trout can generally be distinguished from rainbow trout by the presence of basibranchial teeth at the base of tongue and a maxillary that extends beyond the posterior edge of the eye. Depending on subspecies, strain and habitat, most have distinctive red, pink, or orange linear marks along the underside of their mandibles in the lower folds of the gill plates. These markings are responsible for the common name "cutthroat", first given to the trout by outdoor writer Charles Hallock in an 1884 article in The American Angler. These markings are not unique to the species, some coastal rainbow trout (Oncorhynchus mykiss irideus) and Columbia River redband trout (O. m. gairdneri) populations also display reddish or pink throat markings. At maturity, different populations and subspecies of cutthroat trout can range from 6 to 40 inches (15 to 102 cm) in length, depending on habitat and food availability. Sea-run forms of coastal cutthroat trout average 2 to 5 pounds (0.9 to 2.3 kg). The length and weights of mature inland forms vary widely depending on their particular environment and availability of food. Stream-resident fish are much smaller, 0.4 to 3.2 ounces (11 to 91 g), while lacustrine populations have attained weights ranging from 12 to 17 lb (5.4 to 7.7 kg) in ideal conditions. The largest cutthroat trout subspecies is the Lahontan cutthroat trout (O. c. henshawi). These fish average 8 to 9 in (20 to 23 cm) in small streams and 8 to 22 in (20 to 56 cm) in larger rivers and lakes. In ideal environments, the Lahontan cutthroat trout attains typical weights of 0.25 to 8 lb (0.11 to 3.63 kg). The world record cutthroat trout is a Lahontan at 39 in (99 cm) and 41 lb (19 kg). Cutthroat trout usually inhabit and spawn in small to moderately large, clear, well-oxygenated, shallow rivers with gravel bottoms. They are native to the alluvial or freestone streams typical of tributaries of the Pacific Basin, Great Basin and Rocky Mountains. They spawn in the spring, as early as February in coastal rivers and as late as July in high mountain lakes and streams. Spawning begins when water temperatures reach 43 to 46 °F (6 to 8 °C). Cutthroat trout construct a redd in the stream gravel to lay eggs. The female selects the site for and excavates the redd. Females, depending on size, lay between 200 and 4,400 eggs. Eggs are fertilized with milt (sperm) by an attending male. Eggs hatch into alevins or sac fry in about a month and spend two weeks in the gravel while they absorb their yolk sack before emerging. After emergence, fry begin feeding on zooplankton. Juvenile cutthroat trout typically mature in three to five years. Lake-resident cutthroat trout are usually found in moderately deep, cool lakes with adequate shallows and vegetation for good food production. Lake populations generally require access to gravel-bottomed streams to be self-sustaining, but occasionally spawn on shallow gravel beds with good water circulation. Cutthroat trout naturally interbreed with the closely related rainbow trout, producing fertile hybrids commonly called "cutbows". This hybrid generally bears similar coloration and overall appearance to the cutthroat trout, usually retaining the characteristic orange-red slash. Cutbow hybrids often pose a taxonomic difficulty when trying to distinguish any given specimen as a rainbow or cutthroat trout. In addition, cutthroat trout may hybridize with O. gilae, the Gila trout and O. apache, the Apache trout in regions where their ranges overlap. Cutthroat trout are native to western North America and have evolved through geographic isolation into 14 subspecies, each native to a different major drainage basin. Native cutthroat trout species are found along the Pacific Northwest coast from Alaska through British Columbia into northern California, in the Cascade Range, the Great Basin and throughout the Rocky Mountains including southern Alberta. Some coastal populations of the coastal cutthroat trout (O. c. clarkii) are semianadromous, spending a few months in marine environments to feed as adults and returning to fresh water from fall through early spring to feed on insects and spawn. Cutthroat trout have the second-largest historic native range of North American trout; the lake trout (Salvelinus namaycush) having the largest. Ranges of some subspecies, particularly the westslope cutthroat trout (O. c. lewisi) have been reduced to less than 10 percent of their historic range due to habitat loss and introduction of non-native species. Although members of Oncorhynchus, the Pacific trout/salmon species, three subspecies—the westslope (O. c. lewisi), the greenback (O. c. stomias) and Yellowstone cutthroat trout (O. c. bouvierii)—evolved populations east of the Continental Divide in the upper Missouri River basin, upper Arkansas and Platte River basins and upper Yellowstone River basin, each which drain into the Atlantic basin via the Mississippi River (in 2005, researchers published a report stating that a natural distribution of (O. mykiss), the Conchos trout, is also located in an Atlantic basin drainage). Scientists believe that the climatic and geologic conditions 3 to 5 million years ago allowed cutthroat trout from the Snake River to migrate over the divide into the Yellowstone plateau via Two Ocean Pass. There is also evidence that Yellowstone Lake once drained south into the Snake River drainage. Evidence suggests that the westslope cutthroat trout was able to establish populations east of the divide via Summit Lake at Marias Pass which at one time connected the Flathead River drainage with the upper Missouri River drainage. Scientists speculate that there are several mountain passes associated with the headwaters of the Colorado River drainage and Arkansas/Platte River drainages that would have allowed migration of cutthroat trout east of the divide. Cutthroat trout have been introduced into non-native waters outside their historic native range, but not to the extent of the rainbow trout (O. mykiss). Within the native range of the Yellowstone cutthroat trout, U.S. Fisheries Bureau and National Park Service authorities introduced Yellowstone cutthroat trout into many fishless lakes in Yellowstone National Park. Cutthroat trout were introduced into Lake Michigan tributaries in the 1890s and sporadically in the early 20th century, but never established wild populations. A population of Yellowstone cutthroat trout purportedly has been established in Lake Huron. Although cutthroat trout are not native to Arizona, they are routinely introduced by the Arizona Game and Fish Department into high mountain lakes in the White Mountains in the northeastern region of that state. Cutthroat trout require cold, clear, well-oxygenated, shallow rivers with gravel bottoms or cold, moderately deep lakes. Healthy stream-side vegetation that reduces siltation is typical of healthy cutthroat trout habitat and beaver ponds may provide refuge during periods of drought and over winter. Most populations stay in fresh water throughout their lives and are known as nonmigratory, stream-resident or riverine populations. The coastal cutthroat trout (O. c. clarkii) is the only cutthroat trout subspecies to coevolve through its entire range with the coastal rainbow trout (O. m. irideus). Portions of the westslope cutthroat trout's (O. c. lewisi) range overlap with the Columbia River redband trout (O. m. gairdneri), but the majority of its native range is in headwater tributary streams above major waterfalls and other barriers to upstream migration. At least three subspecies are confined to isolated basins in the Great Basin and can tolerate saline or alkaline water. Cutthroat trout are opportunistic feeders. Stream-resident cutthroat trout primarily feed on larval, pupal and adult forms of aquatic insects (typically caddisflies, stoneflies, mayflies and aquatic dipterans), and adult forms of terrestrial insects (typically ants, beetles, grasshoppers and crickets) that fall into the water, fish eggs, small fish, along with crayfish, shrimp and other crustaceans. As they grow the proportion of fish consumed increases in most populations. In saltwater estuaries and along beaches, Coastal cutthroat trout feed on small fish such as sculpins, sand lance, salmon fry and herring. They also consume shrimp, small squid and krill. In fresh water they consume the same diet as stream resident trout—aquatic insects and crustaceans, amphibians, earthworms, small fish and fish eggs. Within the range of the bull trout (Salvelinus confluentus) the cutthroat trout is a forage fish for the piscivorous bull trout. Various subspecies of cutthroat trout are raised in commercial, state and federal hatcheries for introduction into suitable native and non-native riverine and lacustrine environments. In the early 20th century, several hatcheries were established in Yellowstone National Park by the U.S. Bureau of Fisheries. These hatcheries not only produced stocks of the Yellowstone cutthroat trout (O. c. bouvierii) for the park, but also took advantage of the great spawning stock of cutthroat trout to supply eggs to hatcheries around the U.S. Between the years 1901 and 1953 a total of 818 million trout eggs were exported from the park to hatcheries throughout the U.S. 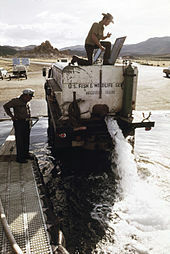 The Lahontan National Fish Hatchery operated by the U.S. Fish and Wildlife Service exists to restore populations of the Lahontan cutthroat trout (O. c. henshawi) in Pyramid, Walker, Fallen Leaf, June, Marlette, and Gull Lakes and the Truckee River in California and Nevada. The hatchery produces about 300,000–400,000 Lahontan cutthroat trout fry annually. The Jackson National Fish Hatchery produces around 400,000 Snake River fine-spotted cutthroat trout (O. c. behnkei) annually to support fisheries in Idaho and Wyoming. The Leadville National Fish Hatchery produces 125,000–200,000 Snake River fine-spotted, greenback cutthroat and rainbow trout annually to support fishing in the Fryingpan and Arkansas River drainages and other Colorado waters. The Bozeman Fish Technology Center, formerly a cutthroat trout fish hatchery in Bozeman, Montana, plays a major role in the restoration of the greenback (O. c. stomias) and westslope cutthroat trout (O. c. lewisi) subspecies. The historic native range of cutthroat trout has been reduced by overfishing, urbanization and habitat loss due to mining, livestock grazing and logging. Population densities have been reduced and in some cases populations have disappeared though competition with non-native brook, brown, lake and rainbow trout, kokanee salmon, lake whitefish and mysis shrimp which were introduced in the late 19th and early 20th centuries. Scientists believe the westslope cutthroat trout will eventually be extirpated from the large lakes in Western Montana due to the trophic cascades resulting from lake trout and mysis shrimp introductions. The most serious current threats to several subspecies are interspecific breeding with introduced rainbow trout creating hybrid cutbows and intraspecific breeding with other introduced cutthroat trout subspecies. In the Greater Yellowstone Ecosystem, the presence of lake trout (Salvelinus namaycush) in Yellowstone Lake in Yellowstone National Park has caused a serious decline in O. c. bouvierii. Outbreaks of whirling disease in major spawning tributaries within the native ranges have also caused declines. Most subspecies of cutthroat trout are highly susceptible to whirling disease, although the Snake River fine-spotted cutthroat trout (O. c. behnkei) appears to be resistant to the parasite. The most serious impact on the genetic purity of most cutthroat trout subspecies results from interspecific and intraspecific breeding resulting in hybrids that carry the genes of both parents. In inland populations, the introduction of rainbow trout from hatchery stocks have resulted in cutbow hybrids that continue to diminish the genetic purity of many cutthroat trout subspecies. The introduction of hatchery-raised Yellowstone cutthroat trout into native ranges of other cutthroat trout subspecies, particularly the westslope cutthroat trout, has resulted in intraspecific breeding and diminished genetic purity of the westslope subspecies. As such, populations of genetically pure westslope cutthroat trout are very rare and localized in streams above barriers to upstream migrations by introduced species. Fisheries biologist Robert J. Behnke attributes the extinction of the yellowfin cutthroat trout (O. c. macdonaldi) and Alvord cutthroat trout (O. c. alvordensis) subspecies to the introduction of non-native rainbow trout. The population at the core of the Yellowstone cutthroat trout's native range, in Yellowstone Lake, declined significantly in the 1960s due to overharvest of mature cutthroat trout by anglers, as well as overharvesting of eggs by hatcheries in the early 20th century. Managers implemented catch and release, which required anglers to return their catches to the lake, and they terminated hatchery operations in the park which allowed the cutthroat trout to recover. Then, in 1994, park officials discovered lake trout (Salvelinus namaycush) in Yellowstone Lake. Although lake trout were established in Shoshone, Lewis and Heart lakes in the Snake River drainage from U.S. government stocking operations in 1890, they were never officially introduced into the Yellowstone River drainage and their presence there is probably the result of accidental or illegal introductions. By 2000, the cutthroat trout population had declined to less than 10 percent of its early 20th century abundance. However, aggressive lake trout eradication programs have killed over one million lake trout since 1996, and the hope is that this will lead to a restoration of cutthroat numbers. Cutthroat trout co-exist with lake trout in Heart Lake, an isolated back-country lake at the head of the Heart River that gets little angling pressure. This 31.5-inch (80 cm) cutthroat trout set a new Utah state record. 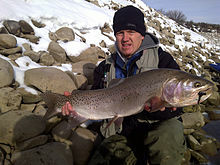 As of March 26, 2011, it was the largest cutthroat trout ever caught and released in Utah. Cutthroat trout are prized as a gamefish, particularly by fly anglers. They are regulated as a gamefish in every state and province they occur in. From the Yellowstone cutthroat trout fishery in Yellowstone National Park, the unique Lahontan cutthroat trout fishery in Pyramid Lake in Nevada, and the small stream fisheries of the westslope cutthroat trout to saltwater angling for sea-run cutthroat trout on the Pacific coast, cutthroat trout are a popular quarry for trout anglers throughout their ranges. The all-tackle world record is 41 lb (19 kg) caught in Pyramid Lake in December 1925. Their propensity to feed on aquatic and terrestrial insects make them an ideal quarry for the fly angler. From Alaska to Northern California, coastal cutthroat trout in sea-run, resident stream and lacustrine forms are sought by anglers. Puget Sound in Washington is a stronghold of sea-run cutthroat trout fishing with its many tributaries and protected saltwater inlets and beaches. Fly anglers search for sea-run cutthroat trout along beaches, river mouths and estuaries year round. In the lower reaches of larger rivers, anglers in drift boats float the rivers searching for trout along the wooded shorelines. In addition to a cutthroat trout sport fishery managed by the Alaska Department of Fish and Game, the Federal Subsistence Management Program manages coastal cutthroat trout subsistence fisheries in Southeast Alaska. Yellowstone National Park was established in 1872. By the 1890s, the Yellowstone cutthroat trout fishery in the Yellowstone River and Yellowstone Lake were well known and being promoted in national guidebooks. Fishing Grounds.—In the river at the lake outlet are the fishing grounds, about a mile from the hotel, while at many places between the lake and canyon excellent fishing is had from shore. The best results in the outlet are had from row boats; they can be rented from the steamboat company who have a supply, as well as competent and experienced oarsmen. Not more than two can successfully fish from one boat. When the grounds are reached, have the oarsman occupy the "stern," as from this position he can manipulate the landing net to a better advantage, the anchor is attached to the "bow." During the trout season (July to September), no better fishing can be found. They average about one and one-half pounds each and are of the salmon myhiss [sic] variety—a catch of 100, three or four hours before sundown, is not unfrequent. In 1902, anticipating the completion of the east entrance road from Cody, Wyoming, Captain Hiram M. Chittenden supervised the construction of the first "Fishing Bridge" across the outlet of Yellowstone Lake. Fishing Bridge was rebuilt in 1919, and reconstructed in 1937, primarily to accommodate vehicle traffic. Between 1916 and 1931, a large development of campgrounds, cabins, stores and service facilities were built just east of the bridge to support anglers. This area is now known as the Fishing Bridge Historic District. The 1937 bridge boasted pedestrian walkways on either side of the roadway to give more room to anglers. Angling in the river, at Fishing Bridge and in the lake, boomed during the 1950s and 1960s and over harvest caused a significant decline in the fishery. Consequently, in 1973, fishing was no longer permitted from Fishing Bridge. The Pyramid Lake strain of Lahontan cutthroat trout, source of the 41-pound (19 kg) world record and native to Pyramid Lake, Lake Tahoe and the Truckee River, was brought to near-extinction in the two decades between the 1920s-40s from overharvest, introduced species and loss of spawning habitat. In the 1970s, Pyramid Lake was stocked with Lahontan cutthroat trout strains still surviving in some nearby lakes, but they were not the large Pyramid Lake strain. Although the Pyramid Lake Paiute Tribe had been successful in reestablishing a cutthroat trout fishery on the reservation in Pyramid Lake, the cutthroat trout were not the large fish of the late 19th and early 20th century. In the late 1970, biologists discovered a surviving population of a pure Pyramid Lake strain in a small headwaters stream on the Nevada-Utah border that had at some point around 1900 been introduced into the stream. In 1995, the U.S. Fish and Wildlife Service began rearing these fish in the Lahontan National Fish Hatcheryin Gardnerville, Nevada. In 2006, the Pyramid Lake strain of Lahontan cutthroat trout were reintroduced into the lake. 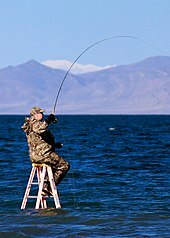 As Pyramid Lake has a very shallow shoreline, anglers use ladders to stand comfortably in 3 to 4 feet (0.9 to 1.2 m) of water and cast to trout cruising along shoreline breaks. Considered a "world-class" fishery, anglers routinely catch cutthroat trout exceeding 10 lb (4.5 kg). The cutthroat trout is the state fish of Idaho, Montana and Wyoming, while particular subspecies of cutthroat are the state fish of Colorado, Nevada, New Mexico and Utah. ^ a b c Richardson, John; Swainson, William; Kirby, William (1836). Fauna boreali-americana, or, The Zoology of The Northern Parts of British America: Containing Descriptions of The Objects of Natural History Collected on The Late Northern Land Expedition, Under Command of Captain Sir John Franklin, R.N. London: J. Murray. pp. 225–226. ^ "Synonyms of Oncorhynchus clarkii (Richardson, 1836)". Fishbase. Retrieved 2014-02-23. ^ a b Behnke, Robert J.; Tomelleri, Joseph R. (illustrator) (2002). "Cutthroat trout Oncorhynchus clarki". Trout and Salmon of North America. The Free Press. pp. 138–139. ISBN 0-7432-2220-2. ^ Behnke, Robert J.; Tomelleri, Joseph R. (illustrator) (2002). "Cutthroat trout Oncorhynchus clarki". Trout and Salmon of North America. The Free Press. p. 139. ISBN 0-7432-2220-2. ^ Behnke, Robert J.; Tomelleri, Joseph R. (illustrator) (2002). "Cutthroat trout Oncorhynchus clarki". Trout and Salmon of North America. The Free Press. p. 146. ISBN 0-7432-2220-2. ^ Behnke, Robert J.; Williams, Ted (2007). About Trout: The Best of Robert J. Behnke from Trout Magazine. Globe Pequot. p. 12. ISBN 978-1-59921-203-6. ^ Trotter, Patrick C. (2008). "Yellowstone Cutthroat Trout". Cutthroat: Native Trout of the West (2nd ed.). Berkeley, CA: University of California Press. p. 258. ISBN 978-0-520-25458-9. ^ Smith, Gerald R.; Stearley, Ralph F. (1989). "The Classification and Scientific Names of Rainbow and Cutthroat Trouts". Fisheries. American Fisheries Society. 14 (1): 4–10. doi:10.1577/1548-8446(1989)014<0004:TCASNO>2.0.CO;2. ^ Behnke, Robert J.; Tomelleri, Joseph R. (illustrator) (2002). "Genus Oncorhynchus". Trout and Salmon of North America. The Free Press. pp. 10–21. ISBN 0-7432-2220-2. ^ a b c Behnke, Robert J. Native Trout of Western North America. American Fisheries Society, 1992 p. 65. ^ a b c d e Trotter, Patrick C.; Behnke, Robert J. (2008). 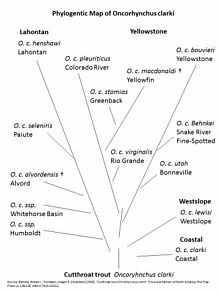 "The Case for Humboldtensis: A Subspecies Name for The Indigenous Cutthroat Trout, Oncorhynchus clarki of The Humboldt River, Upper Quinn River, and Coyote Basin Drainages, Nevada and Oregon". Western North American Naturalist. Monte L. Bean Life Science Museum, Brigham Young University. 68 (1): 58–65. doi:10.3398/1527-0904(2008)68[58:tcfhas]2.0.co;2. JSTOR 41717657. ^ a b c Peacock, Mary M.; Kirchoff, Veronica (June 2007). "Analysis of Genetic Variation and Population Genetic Structure in Lahontan Cutthroat Trout (Oncorhynchus clarki henshawi) Extant Populations Final Report" (pdf). U.S. Fish and Wildlife Service. Retrieved 2016-02-29. ^ a b c d e Behnke, Robert J.; Tomelleri, Joseph R. (illustrator) (2002). "Cutthroat trout Oncorhynchus clarki". Trout and Salmon of North America. The Free Press. pp. 137–234. ISBN 0-7432-2220-2. ^ a b Behnke, Robert J.; Tomelleri, Joseph R. (illustrator) (2002). "Coastal Cutthroat trout Oncorhynchus clarki clarki". Trout and Salmon of North America. The Free Press. pp. 149–154. ISBN 0-7432-2220-2. ^ Trotter, Patrick C. (2008). "Extinct Species". Cutthroat: Native Trout of the West (2nd ed.). Berkeley, CA: University of California Press. pp. 459–465. ISBN 978-0-520-25458-9. ^ Trotter, Patrick C. (2008). "Bonneville Cutthroat trout". Cutthroat: Native Trout of the West (2nd ed.). Berkeley, CA: University of California Press. pp. 321–330. ISBN 978-0-520-25458-9. 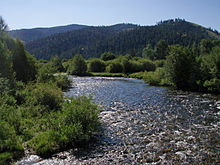 ^ Its range is designated as the Humboldt River distinct population segment of O. c. henshawi by U.S. Fish and Wildlife Service and Nevada Division of Wildlife Trotter, Patrick C. (2008). "Humboldt Cutthroat Trout". Cutthroat: Native Trout of the West (2nd ed.). Berkeley, CA: University of California Press. pp. 191–214. ISBN 978-0-520-25458-9. ^ "Species Profile-Lahontan cutthroat trout (Oncorhynchus clarkii henshawi)". U.S. Fish and Wildlife Service. Archived from the original on 2013-11-13. Retrieved 2013-12-25. ^ "Species Profile-Paiute cutthroat trout (Oncorhynchus clarkii seleniris)". U.S. Fish and Wildlife Service. Archived from the original on 2013-12-26. Retrieved 2013-12-25. ^ Trotter, Patrick C. (2008). "Finespotted Snake River". Cutthroat: Native Trout of the West (2nd ed.). Berkeley, CA: University of California Press. pp. 295–319. ISBN 978-0-520-25458-9. ^ Trotter, Patrick C. (2008). "Westslope Cutthroat Trout". Cutthroat: Native Trout of the West (2nd ed.). Berkeley, CA: University of California Press. pp. 103–143. ISBN 978-0-520-25458-9. ^ Trotter, Patrick C. (2008). "Extinct Subspecies". Cutthroat: Native Trout of the West (2nd ed.). Berkeley, CA: University of California Press. pp. 449–465. ISBN 978-0-520-25458-9. ^ Trotter, Patrick C. (2008). "Yellowstone Cutthroat Trout". Cutthroat: Native Trout of the West (2nd ed.). Berkeley, CA: University of California Press. pp. 245–294. ISBN 978-0-520-25458-9. ^ Trotter, Patrick C. (2008). "Colorado River Cutthroat Trout". Cutthroat: Native Trout of the West (2nd ed.). Berkeley, CA: University of California Press. pp. 359–388. ISBN 978-0-520-25458-9. ^ "Species Profile-Greenback Cutthroat trout (Oncorhynchus clarki stomias)". U.S. Fish and Wildlife Service. Archived from the original on 2013-12-26. Retrieved 2013-12-25. ^ Trotter, Patrick C. (2008). "Rio Grande Cutthroat Trout". Cutthroat: Native Trout of the West (2nd ed.). Berkeley, CA: University of California Press. pp. 421–447. ISBN 978-0-520-25458-9. ^ Trotter, Patrick C. (2008). Cutthroat: Native Trout of the West (2nd ed.). Berkeley, CA: University of California Press. p. 16. ISBN 978-0-520-25458-9. ^ Trotter, Patrick C. (2008). Cutthroat: Native Trout of the West (2nd ed.). Berkeley, CA: University of California Press. p. 13. ISBN 978-0-520-25458-9. ^ a b "Trout, Cutthroat (Oncorhynchus clarki)". International Game Fish Association. Retrieved 2013-12-23. ^ a b Behnke, Robert J.; Tomelleri, Joseph R. (illustrator) (2002). "Cutthroat trout Oncorhynchus clarki". Trout and Salmon of North America. The Free Press. pp. 141–142. ISBN 0-7432-2220-2. ^ "Cutthroat Trout (Oncorhynchus clarki)" (pdf). U.S. Department of Agriculture. January 2007. Retrieved 2014-03-17. ^ a b c Halverson, Anders (2010). "A Single New Mongrel Species". An Entirely Synthetic Fish: How Rainbow Trout Beguiled America and Overran the World. New Haven, CT: Yale University Press. pp. 145–164. ISBN 978-0-300-14087-3. ^ "Apache Trout Oncorhynchus apache Recovery Plan" (pdf). U.S. Fish and Wildlife Service. August 2009. Retrieved 2013-12-25. ^ a b "NAS - Nonindigenous Aquatic Species-Oncorhynchus clarki". U.S. Geological Survey. Retrieved 2013-12-20. ^ Behnke, Robert J.; Tomelleri, Joseph R. (illustrator) (2002). "Cutthroat trout Oncorhynchus clarki". Trout and Salmon of North America. The Free Press. pp. 143–145. ISBN 0-7432-2220-2. ^ Behnke, Robert J.; Tomelleri, Joseph R. (illustrator) (2002). "Cutthroat trout Oncorhynchus clarki". Trout and Salmon of North America. The Free Press. p. 143. ISBN 0-7432-2220-2. ^ "Conservation of The Conchos Trout: A White Paper On History of Its Discovery, Report on Its Status, and An Urgent Plea For Action" (PDF). Truchas Mexicanas. Retrieved 2014-02-12. ^ Trotter, Patrick C. (2008). "Evolution and Prehistoric Distribution". Cutthroat: Native Trout of the West (2nd ed.). Berkeley, CA: University of California Press. pp. 56–57. ISBN 978-0-520-25458-9. ^ Trotter, Patrick C. (2008). "Evolution and Prehistoric Distribution". Cutthroat: Native Trout of the West (2nd ed.). Berkeley, CA: University of California Press. p. 51. ISBN 978-0-520-25458-9. ^ Trotter, Patrick C. (2008). "Greenback Cutthroat Trout". Cutthroat: Native Trout of the West (2nd ed.). Berkeley, CA: University of California Press. pp. 389–398. ISBN 978-0-520-25458-9. ^ Kendall, W. C. (1915). The Fishes of the Yellowstone National Park (pdf). Washington D.C.: Department of Commerce, Bureau of Fisheries. pp. 3–9. ^ Crawford, Stephen Scott (2001). Salmonine Introductions to the Laurentian Great Lakes: An Historical Review and Evaluation of Ecological Effects. National Research Council of Canada. p. 74. ISBN 0-660-17639-4. ^ "NAS - Nonindigenous Aquatic Species / Specimen Information / Oncorhynchus clarkii (Cutthroat Trout)". Retrieved 2016-04-27. ^ "Cutthroat Trout". Arizona Game and Fish Department. Archived from the original on 2013-12-24. Retrieved 2013-12-23. ^ White, Seth M.; Rahel, Frank J. (2008). "Complementation of Habitats for Bonneville Cutthroat Trout in Watersheds Influenced by Beavers, Livestock, and Drought" (pdf). Transactions of the American Fisheries Society. 137 (3): 881–894. doi:10.1577/t06-207.1. Retrieved 2013-12-23. ^ Jakober, Michael J.; McMahon, Thomas E.; Thurow, Russell F.; Clancy, Christopher G. (1998). "Role of stream ice on Fall and Winter Movements and Habitat Use by Bull Trout and Cutthroat Trout in Montana Headwater Streams" (PDF). Transactions of the American Fisheries Society. 127 (2): 223–235. doi:10.1577/1548-8659(1998)127<0223:rosiof>2.0.co;2. Archived from the original (pdf) on 2013-12-12. Retrieved 2013-12-23. ^ Behnke, Robert J.; Tomelleri, Joseph R. (illustrator) (2002). "Westslope cutthroat trout Oncorhynchus clarki lewisi". Trout and Salmon of North America. The Free Press. pp. 158–160. ISBN 0-7432-2220-2. ^ "Lahontan Cutthroat Trout Oncorhynchus clarki henshawi". U.S. Fish and Wildlife Service. Archived from the original on 2013-12-31. Retrieved 2013-12-30. ^ Johnson, Les (2004). "Life History of the Coastal Cutthroat". Fly-Fishing Coastal Cutthroat Trout: Flies, Techniques, Conservation. Portland, OR: Frank Amato Publishers. pp. 21–26. ISBN 978-1-57188-334-6. ^ "BC Conservation Data Centre: Species Summary Oncorhynchus clarkii Cutthroat Trout". Ministry of Environment, Government of British Columbia. Retrieved 2013-12-23. ^ "Bull Trout Facts (Salvelinus confluentus)" (PDF). U.S. Fish and Wildlife Service. Archived from the original (pdf) on 2013-02-12. Retrieved 2013-12-30. ^ Franke, Mary Ann (Fall 1996). "A Grand Experiment—100 Years of Fisheries Management in Yellowstone: Part I" (PDF). Yellowstone Science. 4 (4): 5. Archived from the original (pdf) on 2014-12-16. Retrieved 2014-03-01. ^ "The Lahontan National Fish Hatchery". U.S. Fish and Wildlife Service. Retrieved 2013-12-20. ^ "Jackson Species and Production". U.S. Fish and Wildlife Service. Archived from the original on 2014-11-29. Retrieved 2013-12-20. ^ "Leadville Species and & Production". U.S. Fish and Wildlife Service. Retrieved 2013-12-20. ^ "Bozeman Fish Technology Center". Retrieved 2013-12-20. ^ Behnke, Robert J.; Tomelleri, Joseph R. (illustrator) (2002). "Cutthroat trout Oncorhynchus clarki". Trout and Salmon of North America. The Free Press. pp. 147–148. ISBN 0-7432-2220-2. ^ Ellisa, Bonnie K.; Stanford, Jack A.; Goodman, Daniel; Stafford, Craig P.; Gustafson, Daniel L.; Beauchamp, David A.; Chess, Dale W.; Craft, James A.; Deleray, Mark A.; Hansen, Barry S. (2010-12-09). "Long-term Effects of a Trophic Cascade in a Large Lake Ecosystem" (pdf). Proceedings of the National Academy of Sciences of the United States of America. National Academy of Sciences. 108 (3): 1070–5. Bibcode:2011PNAS..108.1070E. doi:10.1073/pnas.1013006108. PMC 3024674. PMID 21199944. Retrieved 2014-03-12. ^ a b Koel, Todd M.; Bigelow, Patricia E.; Doepke, Philip D.; Ertel, Brian D.; Mahony, Daniel L. (Spring 2006). "Conserving Yellowstone Cutthroat Trout for the Future of the GYE" (pdf). Yellowstone Science. National Park Service. 14 (2): 20–28. Retrieved 2014-03-12. ^ Nickum, David (January 1999). "Whirling Disease in the United States" (PDF). Trout Unlimited. Archived from the original (pdf) on 2013-12-26. Retrieved 2014-03-01. ^ Behnke, Robert J.; Tomelleri, Joseph R. (illustrator) (2002). Trout and Salmon of North America. New York: Free Press. pp. 201–206, 221–224. ISBN 0-7432-2220-2. ^ a b Schullery, Paul; Varley, John D. (1998). "Wilderness Defined-The Evolution of an Ideal". Yellowstone Fishes—Ecology, History, and Angling in the Park. Mechanicsburg, PA: Stackpole Books. pp. 90–101. ISBN 0-8117-2777-7. ^ Kaeding, Lynn R.; Boltz, Glenn D.; Carty, Daniel G. (1995). Varley, John D.; Schullery, Paul (eds.). "Lake Trout Discovered In Yellowstone Lake" (pdf). The Yellowstone Lake Crisis: Confronting a Lake Trout Invasion. National Park Service. pp. 5–6. Retrieved 2014-03-01. ^ Kendall, W. C. (1921). The Fishes of the Yellowstone National Park. Washington D.C.: Department of Commerce, Bureau of Fisheries. pp. 22–23. ^ "Lake Trout Suppression and Yellowstone Cutthroat Trout Recovery: It's About More than Just Fish". Yellowstone Park Foundation. Archived from the original on 2013-12-24. Retrieved 2013-12-23. First 15 Years: 500,000 lake trout caught and eliminated. 2011 and 2012: 525,000 lake trout caught and eliminated 2013: 172,000 in the first six weeks of the season. ^ Parks, Richard (2003). Fishing Yellowstone National Park-An Angler's Complete Guide to more than 100 streams, rivers and lakes (2nd ed.). Guildford, CT: Globe Pequot Press. pp. 107–108. ISBN 0-7627-2285-1. ^ "Curtis Robinson shows the huge cutthroat trout". Utah Wildlife Photos. Retrieved 2014-01-03. ^ Jacklin, Bob; LaFontaine, Gary (2004). Fly Fishing the Yellowstone in the Park. Guilford, CT: Globe Pequot Press. p. 110. ISBN 1-59228-076-5. The Yellowstone River is known widely for two things: The Spectacular Yellowstone Falls and a few miles of world-class dry-fly fishing for native cutthroat trout. ^ Matthews, Craig; Molinero, Clayton (1997). The Yellowstone Fly-Fishing Guide. Guilford, CT: The Globe Pequot Press. p. 11. ISBN 1-55821-545-X. In 1994 Yellowstone Park official introduced a fee permit policy to help pay the increased cost of protecting and enhancing this world-class fishery. ^ Johnson, Les (2004). Fly-Fishing Coastal Cutthroat Trout: Flies, Techniques, Conservation. Portland, OR: Frank Amato Publishers. ISBN 978-1-57188-334-6. ^ McClane, A. J.; Gardner, Keith (1984). "Cutthroat Trout Salmo clarki". McClane's Game Fish of North America. New York: Times Books. pp. 94–100. ISBN 0-8129-1134-2. ^ Johnson, Les (2004). "Coastal Cutthroat Trout in Washington". Fly-Fishing Coastal Cutthroat Trout: Flies, Techniques, Conservation. Portland, OR: Frank Amato Publishers. pp. 45–55. ISBN 978-1-57188-334-6. ^ "Federal Subsistence Board". U.S. Department of Agriculture. Retrieved 2014-03-04. ^ "The Status and Management of Coastal Cutthroat Trout in Alaska" (pdf). Alaska Department of Fish and Game. Retrieved 2014-03-03. ^ Schullery, Paul (2010). "World War II and Mission 66 at Fishing Bridge". Nature and Culture at Fishing Bridge-A History of the Fishing Bridge Development in Yellowstone National Park (PDF). National Park Service, Yellowstone Center for Resources Yellowstone National Park, Wyoming. p. 54. Archived from the original (pdf) on 2016-03-06. Retrieved 2016-11-09. ^ Schullery, Paul (2010). Nature and Culture at Fishing Bridge-A History of the Fishing Bridge Development in Yellowstone National Park (PDF). National Park Service, Yellowstone Center for Resources Yellowstone National Park, Wyoming. pp. 15–16. Archived from the original (PDF) on 2016-03-06. Retrieved 2016-11-09. ^ Schullery, Paul (2010). "The Cody Road and First Bridge". Nature and Culture at Fishing Bridge-A History of the Fishing Bridge Development in Yellowstone National Park (PDF). National Park Service, Yellowstone Center for Resources Yellowstone National Park, Wyoming. pp. 17–23. Archived from the original (pdf) on 2016-03-06. Retrieved 2016-11-09. ^ Schullery, Paul (2010). "The Development of the Fishing Bridge Area, 1918–1941". Nature and Culture at Fishing Bridge-A History of the Fishing Bridge Development in Yellowstone National Park (PDF). National Park Service, Yellowstone Center for Resources Yellowstone National Park, Wyoming. pp. 25–50. Archived from the original (pdf) on 2016-03-06. Retrieved 2016-11-09. ^ Franke, Mary Ann (Winter 1997). "A Grand Experiment—The Tide Turns in the 1950s: Part II" (PDF). Yellowstone Science. 5 (1): 9. Archived from the original (pdf) on 2016-03-12. Retrieved 2014-04-09. ^ "Pyramid Paiute Tribe: About Us". Retrieved April 22, 2018. ^ "Lahontan National Fish Hatchery". U.S. Fish and Wildlife Service. Retrieved April 22, 2018. ^ "About Pyramid Lake Fish Hatcheries". pyramidlakefisheries.org. Retrieved April 22, 2018. ^ Schweber, Nate (2013-04-23). "20 Pounds? Not Too Bad, for an Extinct Fish". The New York Times. Retrieved 2014-03-03. ^ "Pyramid Lake Fisheries". Pyramid Lake Fisheries.org. Retrieved 2014-03-03. Pyramid Lake is widely regarded as a world class fishery for the Lahontan Cutthroat Trout. ^ "Idaho State Emblems". Idaho Secretary of State. Archived from the original on 2012-03-13. Retrieved 2013-12-23. ^ "Montana Code Annotated 2013 State Fish". Montana Legislature. Retrieved 2013-12-23. ^ "State Symbols". Wyoming Secretary of State. Archived from the original on 2013-12-24. Retrieved 2013-12-23. ^ "Nevada Facts and State Emblems". Nevada Legislature. Archived from the original on 2014-03-27. ^ "State Symbols". New Mexico Secretary of State. Retrieved 2013-12-23. ^ "Utah State Fish — Bonneville Cutthroat Trout". Pioneer Utah's Online Library. Retrieved 2013-12-23. Barron, Terry. Guide to Fly Fishing Pyramid Lake A Quick Clear Understanding of the Nations Top Lahontan Cutthroat Trout Fishery. Tucson, AZ: No Nonsense Fly Fishing Guidebooks. ISBN 978-0-9637256-3-9. Oliver B. Cope (1958). "Annotated Bibliography on the Cutthroat Trout-Fishery Bulletin 140" (pdf). U.S. Fish and Wildlife Service. Retrieved 2014-01-07. Johnson, Les (1976). Sea-run Cutthroat Trout. Portland, OR: Frank Amato Publishers. ISBN 978-0-936608-02-0. Johnson, Les (2004). Fly-Fishing Coastal Cutthroat Trout: Flies, Techniques, Conservation. Portland, OR: Frank Amato Publishers. ISBN 978-1-57188-334-6. Rubingh, Jim; Fritz, Richard (2009). Colorado Greenback Cutthroat Trout: A Fisherman's Guide. Portland, OR: Frank Amato Publishers. ISBN 978-1-57188-447-3. Trotter, Patrick C. (2008). Cutthroat: Native Trout of the West (2nd ed.). Berkeley, CA: University of California Press. ISBN 978-0-520-25458-9. Wikimedia Commons has media related to Oncorhynchus clarkii.